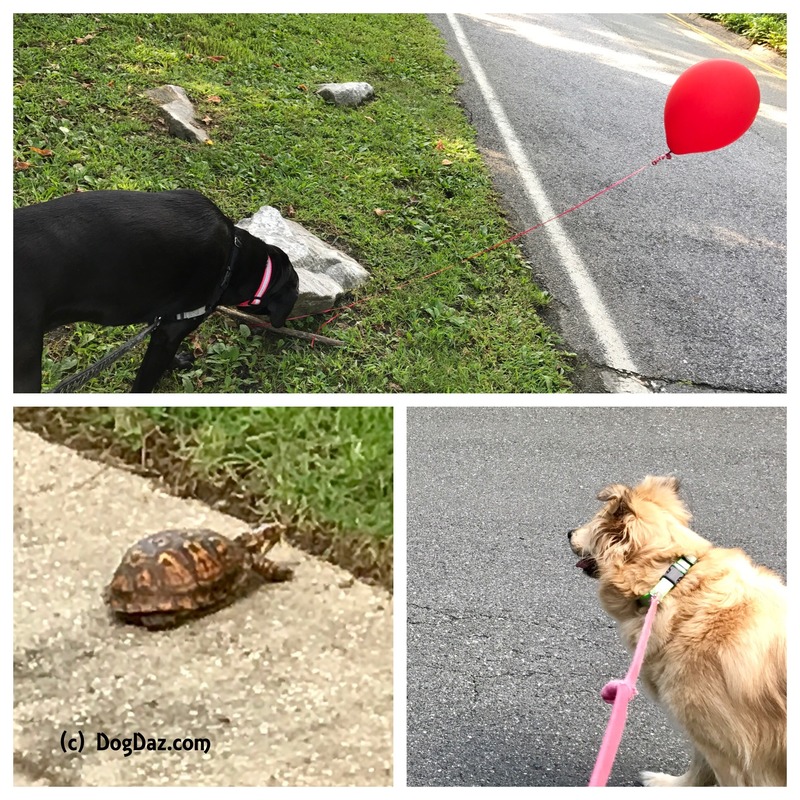 Hello Blog Friends – We found some very interesting things on our walk today that I want to tell you about. We found a red balloon, which we learned means that there are clowns in the storm drains. We think that is just silly. The kids told us the clown’s name is “Pennywise.” We think Pennywise may just be clownfoolish. I think we will stay away from the storm drains for a while anyway. Mom says they are dangerous for dog paws and best to be avoided if something is going to grab you and pull you in. Then we found an Eastern Box Turtle walking across the road. We wanted to play with it but Mommy said ‘No.’ She always says ‘No.’ These are common turtles in our area and best left alone unless they are in danger. Around here you have to be careful because the car in front of you may stop for what appears to be no reason and you will find it is to let the turtle cross the road. That makes me think of a joke: “Why did the turtle cross the road…. to get to the other side. ” Bark Out Loud, I am funny!!! Mom hates balloons. She has balloonaphobia since she’s little. One of my labs once picked a turtle up in her mouth when she was in the back yard. She came to me for help getting it out of her mouth. I almost had to take her to the vet!!!!! She thought it was at Ball I guess. The dog was fine, the turtle was fine and I needed a glass of wine to recover! We saw a turtle yesterday. I kept my lovely new lab pup away!!! Oh my. None here have a actually done more than harass. Definitely a wine moment. Your mom is very wise, kids… About turtles AND deadly killer clowns! I’m happy you have her to keep you safe. We think she protests too much but we are glad to have her. A balloon and a turtle? That was quite the interesting walk! BOL!! Wow that is so cool you guys have wild turtles in your neighborhood!! I’ve never heard of that one before! I loved that joke! I definitely barked out loud! Happy to hear you listened to your mom and the turtle did get to cross the road after all.